Older Washington, DC homes sometimes offer more charm and character than the newer houses of today. They boast gabled roofs, crown moldings, hardwood floors and antique fixtures. Buying an old house is like buying a piece of local history. Its beautiful period features can give it a timeless beauty and grace that is hard to resist. However, buying a house from another era can be an endeavor fraught with potential problems. 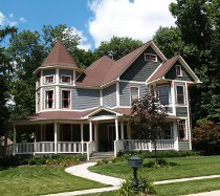 Older houses are not necessarily built to the same electrical or plumbing standards of today. Plus, if they have not been maintained correctly through the years, they can turn into a serious money pit or a potential hazard. Always hire a professional real estate inspector to take a close look at the property. A professional inspector is trained to spot structural damage or issues that might seem minor, but may cause major problems in the future. Look for signs of moisture damage. Many old houses have problems with moisture because over the years they have settled. If the old house you are considering has vintage wiring, such as the knob-and-tube technology that was popular around the 1920s and 1930s, plan to completely update the wiring for your safety. You might need to add insulation. Many older homes don't have insulation in the walls or attic, which can increase the size of your energy bill. Be on the look out for iron pipes, which were popular up until 1940. They can become clogged with rust and may need to be replaced. Have the house tested for asbestos, if it was built before the 1960s. These are just a few things to which to pay attention out when buying an older home. Take time to inspect the property thoroughly. With proper attention, you can mix today's modern technology with your home's period features to create a combination of charm and safety.